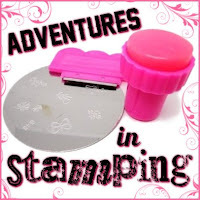 Time for another Bundle Monster stamping plate review. Today I have plate 612 from the CYO 2014 Collection. I used two images from this plate to create my design. I added the first image using Milani Rapid Cherry over Spotlight White. As you can see the image is quite large on my nails. If you have small nails like mine, you will want to watch how you place it if you want the hearts to show. I wasn't worried about that because of the design I had in mind. I added my next layer using Black Swift. I flipped the first image and applied it on all but my ring finger. I added the lady skeleton on my ring finger. Again the image was large for my nail. I fit the silhouette but not the frame. The plate was etched perfectly and the images transferred nice and clean. As you can see from my clean lines. Another fantastic plate from Bundle Monster. You can purchase this as a single or the entire collection. 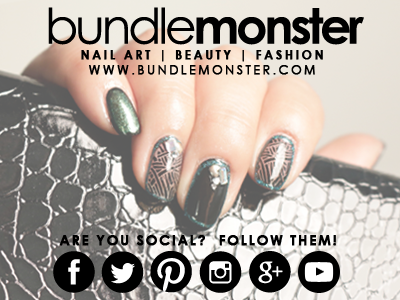 I just love how your ring finger turned out!